The UK NHS is being stitched up by the EU and US corporates. 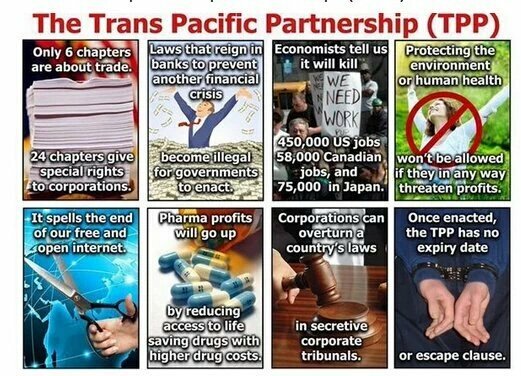 TTIP is a very sinister trade deal being negotiated in secret by unelected Eurocrats in Brussels and American Government officials. TTIP is a massive danger to British sovereignty over the NHS. It could make the sell-off of our NHS irreversible. UK is not allowed to be at the talks but is represented by EU bureaucrats so UK interests will not be taken into account. The Labour, Tory, Liberal Dems and the Green party are all supporting TTIP. UKIP are not. · They will also get the right to choose one of the panel of three international judges sitting in secret; The judges will not be independent but lickspittles of the US corporates and the EU. · These judges will be able to be award fines of unlimited £billions on British tax-payers money, with no right of appeal. The US Corporates will make a lot of money out of our patients and no doubt be very selective on who they choose to treat. As I say the EU is trying to stitch us up. A senior UN official has just spoken out about the secretive TTIP trade deal, warning of “a dystopian future in which corporations call the shots instead of democracies”, and highlighting significant fears about human rights abuses should the deal go through. Next month is a pivotal moment to stop TTIP for good: the European Parliament will be voting on a landmark resolution on TTIP. A whopping 1.7 million of us — including you — have already signed up to oppose the devastating TTIP deal, and now we’re pushing to hit 2 million signatures before the big vote to ensure our MEPs force the European Commission to stand up for democracy. see also uhb.nhs.uk/Downloads/pdf/EuropeanUnionDirectives.pdf … for a thorough review.